June Lockhart (born in New York City, U.S.) is a famous Actress from USA, she is 93 years old and still alive, born June 25, 1925. 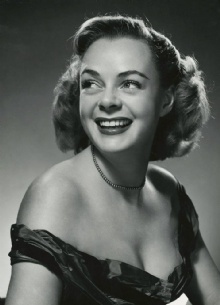 June Lockhart is an American actress, daughter of actors Gene and Kathleen Lockhart Lockhart. She made her acting debut at age eight in the Metropolitan Opera production of Peter Ibbetson. Her first feature film role was in 1938 alongside her parents in A Christmas Carol. In 1948 she won a Tony Award for her performance in the Broadway production of For Love or Money. In the 1940s she had roles in feature films such as Hell, where is thy victory, Meet Me in St. Louis and The Yearling. In the following decade, she began playing mostly guest roles in several television series, including series such as Rawhide Western, Zane, and Gunsmoke. Between 1958 and 1964 she starred in the series Lassie in 200 episodes (mother of Timmy). The following year she won a starring role in the series Lost in Space. Until 1968, she starred in 84 episodes, Dr. Maureen Robinson. After the end of this series, she played from 1968 to 1970 in the sitcom petticoat Junction. Between 1984 and 1998 she played intermittently in the soap opera General Hospital, the recurring role of Maria Ramirez. In 1986 she played in the fantasy film Troll on the side of their daughter Anne Lockhart. In the television series based on the feature film Lost in Space by 1998 she had a cameo appearance. Lockhart has been divorced twice and has two daughters. She is born under the zodiac cancer, who is known for Emotion, Diplomatic, Intensity, Impulsive, Selective. Our collection contains 3 quotes who is written / told by June. "I did Lassie for six years and I never had anybody come up to me and say, 'It made me want to be a farmer.'" "I guess the producers saw me and knew I was literate and I always tried to be alert and it's funny because you have to have a sharpness to do those shows, especially some of the ones I did in later years"
"It was a show where you were given a quote out of current events and you had to identify who said it. I was reading eight newspapers a day and had compiled a file of about 300 quotes. I really had to do my research. The White House press didn't have to bone up on any of it"